A custom-designed album is a premium product and the perfect way to enjoy your memories in a physical form. The exceptionally handcrafted album holds your favorites memories that you can enjoy yourself and later pass down to your children as a small heirloom. The archival paper and exceptional flush-mount printing of each album gives you the peace of mind knowing you can view and share these images for years to come. You can choose from beautiful natural linens, lux linen, and nabuk luxe leather imported from Italy to create the most stunning album. It is an artful way to view your images and most importantly, it becomes your child's first family heirloom! Not to mention, great gifts for your family members as well. The hardcover book is a great alternative to the album, if you’d prefer to save a little but still maintain the attention to detail seen in the albums. 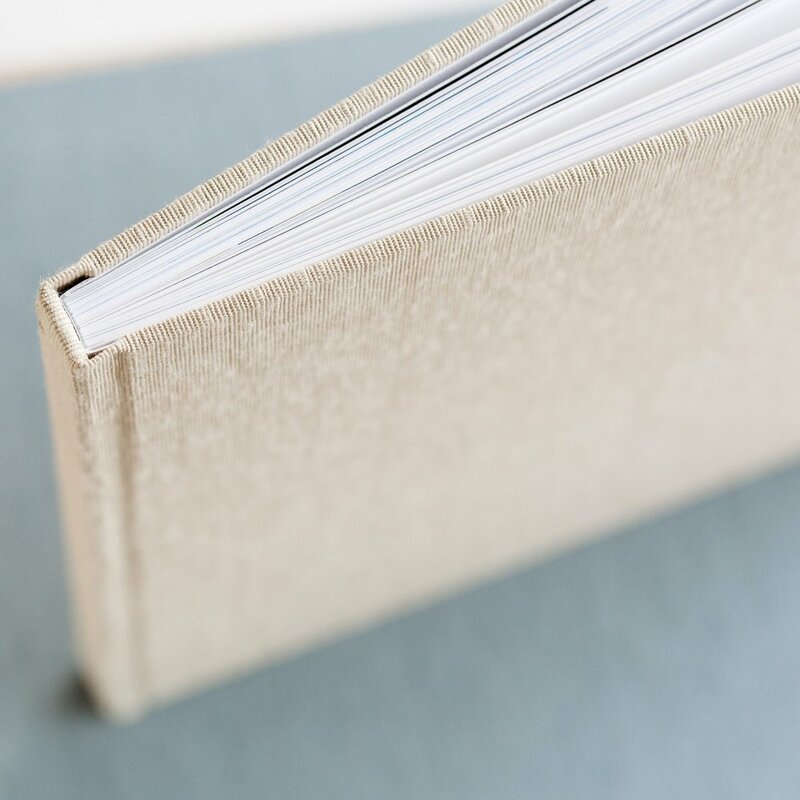 The books feature press printed papers (smooth matte and superfine eggshell) and are bound more like a magazine style so the pages do not lay flat. Since they do not lay flat, I recommend a more simple image design that does not allow images to run across the center. The books are identical in appearance on the exterior and use the same European linen materials for the cover. The books and albums are made with archival materials and are made to last a lifetime, so the option between the two comes down to your personal aesthetic. This is an exciting collaboration and my goal is to make this process as simple as possible! The first step will be to have your favorite images selected within your online gallery (select up to 100-150 of your favorite images). I will use the bulk of these images to create your design. I will sprinkle a few additional images within the design to help give the album a flow and help tell a visual story of your wedding day. The main design will typically take up to 2 weeks to finalize. You will have 2 opportunities to review and make any edits to your design. Once the design as been approved, we simply need to select your cover materials and details. That is it! The whole process typically takes up to 3-4 weeks. Once the product has been ordered, it can take up to 4 weeks to be printed, bound, and shipped. Often, orders will ship earlier. For an additional fee of $175 per album, I can have your flush-mount albums printed and shipped within 7 days. If you’d like to get some inspiration for your album, please see RedTree Albums instagram account, HERE. If you see any other products that you love, please let me know and we can do a custom order. No problem! I simply offer a more limited selection to simplify the decision process. You can view all the cover materials HERE. I can send you my personal swatch kit to review for an additional fee of $25. You can personalize your album cover with a cameo cut-out photo or standard text debossing. The cameo cut-out options can be seen HERE. The standard fonts included with your album can be viewed HERE. If you’d like your own custom font, we can create a custom debossing order for you for an additional fee of $45 for 4x2 and $85 for 7x3. Foil debossing is available exclusively for the new Luxe Linen covers. Color options include gold, silver, and rose gold (no additional fee). There is a max of 40 spreads in the flush mount albums. The standard page thickness is a little over 1mm. However, for more than 30 spreads, a slightly thinner substrate between the spreads is used. This is done to make room for extra spreads without compromising the quality of the album.